He’s creating his own CFL legacy. Tre Roberson, grandson of Larry Highbaugh and former college quarterback, joined the Stampeders as a rookie in 2018 and became an immediate starter in the secondary. “Life’s full of changes. I wasn’t even expecting to be playing corner. Or playing corner up in Canada. This is my first time in Canada. In his freshman campaign with the Red & White, Roberson compiled 54 tackles, three interceptions, two forced fumbles, and five knockdowns over 16 games. In the post-season, he added another nine tackles, a huge interception, and a forced fumble en route to winning a Grey Cup. The 26-year old defensive back was a key cog on one of the league’s top defensive unit and earned the team’s nomination for Most Outstanding Rookie. “He’s a very cerebral player,” said defensive backs coach Joshua Bell. “But he has the physical attributes to go with it. “He soaks up everything, when you tell him something you can tell that he’s receiving everything you’re saying, processing it. “First thing that I identified and loved is that he wasn’t afraid of the waggle. I loved that, because the speed is the first thing guys coming from down south have to adjust to. 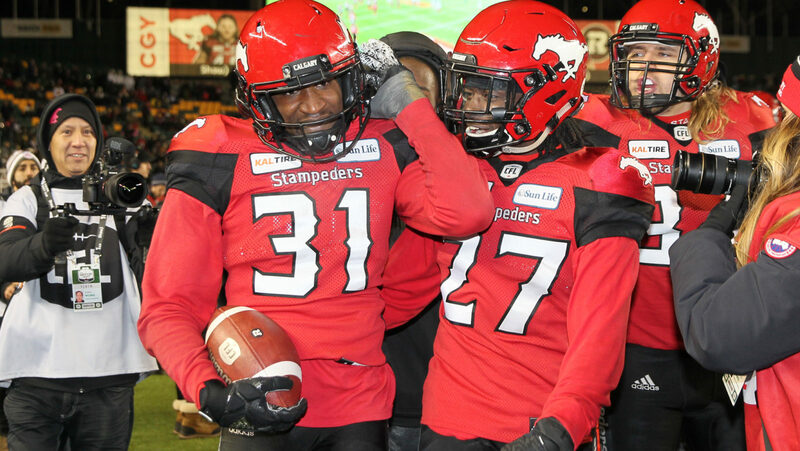 While the secondary has seen some changes in the off-season, Roberson will be back with the Stampeders in his familiar position manning the boundary corner.